Over 100,000 people will make their way downtown for the Browns and Indians games on Friday. Throw in some rain and the chance for storms, and it could get messy if you don't plan ahead. A storm system from the west is headed our way, which will help fuel storms today. There's a possibility for heavy rainfall in some areas after 3 p.m. today. Higher chances for t-storms today thanks to a system to our West. It's going to kick out bits of energy which will help produce a few pockets of rain/thunder. By 7 p.m., showers and storms may linger in the area—leaving room for humidity to take over. Storm chances are mainly focused in the areas south of Cleveland. 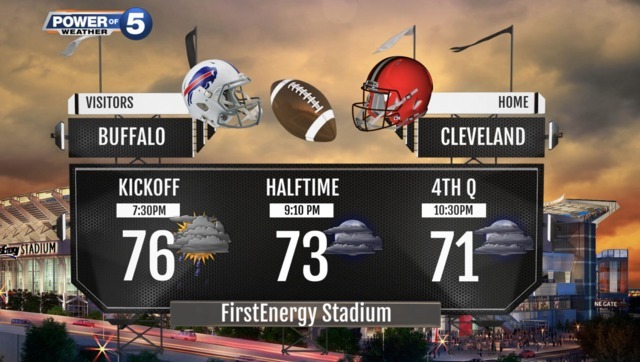 As the games wrap up, clouds will linger giving a small chance of rain to appear again. Stay up to date with our radar here .